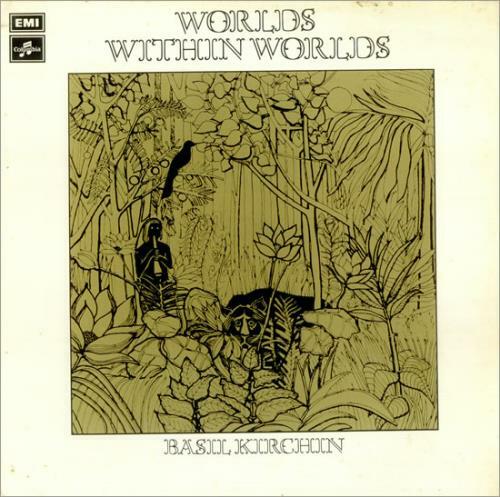 BASIL KIRCHIN Worlds Within Worlds (Incredibly rare original boxed EMI Columbia FACTORY SAMPLE stickered label 2-track STEREO vinyl LP, front laminated flipback picture sleeve. This highly desirable item has been locked away in storage for over 30 years and has only just been brought back to light. See 'more info' for further details including tracklisting and condition... A remarkable artefact SCX6463). Basil's name was included on Nurse With Wound's infamous 'list' [available with original copies of their first LP] and subsequently became a collectable artist for fans of underground music and the avant-garde... if they could only find the records! Now's your chance to own his rarest LP. Basil's name is now familiar with those interested in the pre-history of British electronic and experimental music. His music has recently been documented and re-released by Trunk Records, albeit in a form much truer to his original vision, under the title Quantum. Hampered by record company interference, his music was decades ahead of its time and as such it is only with the musical landscape of today that it can start to be appreciated. 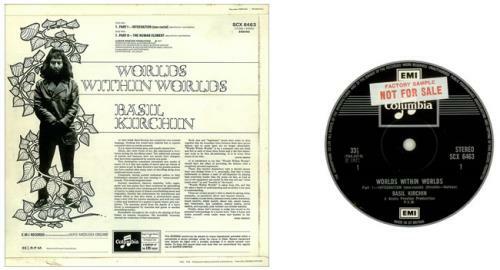 Worlds Within Worlds [Parts I & II] is his first concept album, having abandoned earlier work with his big band. It is a British commercially released LP like no other before it, a truly unique effort. Basil's spiritual and philosophical motivation for creating sound had no match in Britain outside of academys and universities which specialised in electro-acoustic music at the time. Worlds Within Worlds essentially combines traditional instruments with wildlife sounds and the amplified noise of insects, in what one would be inclined to call a 'musique concrete' avant-garde style. Tape is painstakingly spliced, edited, looped and manipulated to create a whole new world of utterly alien yet beautiful soundscapes. In hindsight, these sounds now clearly anticipate the subsequent ambient experiments of Brian Eno [who writes the sleeve notes for its follow-up Worlds Within Worlds 3/4], as well as a generation of today's electronic artists such as Aphex Twin. Unconfirmed line-up: Evan Parker: soprano; Derek Bailey: guitar; Frank Ricotti: marimba, organ. The front laminated picture sleeve has some slight 'foxing' and age spots evident only to its edges. It otherwise easily qualifies for an EX+ grade with a perfectly legible spine, secure flipbacks and a bright and vivid print with no fading or blemishes to the text. The vinyl is housed in a period EMI catalogue inner, with unmarked and clean boxed EMI Columbia labels, FACTORY SAMPLE stickered to one side for promotional use. It is in perfect MINT condition; visually there is nothing to suggest this record has been played more than once, if that! A real holy-grail for the adventurous music fan and record collector. Do not miss!